Tooth erosion is a serious issue affecting many Americans. Tooth erosion causes pain and increases the risk of tooth decay and tooth loss. The condition results from damage to the enamel. Unfortunately, once tooth enamel is damaged, it will not repair itself. Thankfully, Dr. Michael Bixby, a leading Red Bank cosmetic dentist, offers numerous treatments to treat tooth erosion. To determine the best treatment for you, schedule an appointment with Dr. Bixby today. In the meantime, here are some tips to reduce and prevent tooth erosion. 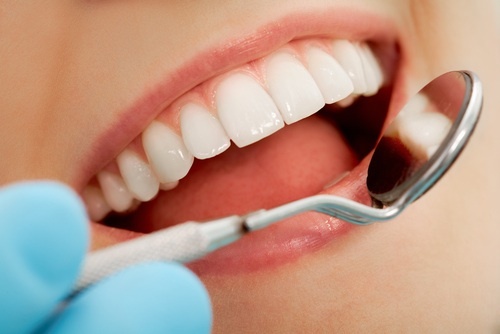 Tooth erosion is the wearing away of tooth enamel. Tooth enamel is the extremely hard, protective outer layer of our teeth that protects the dentin. Dentin gives teeth their color and is full of microscopic tubules. Exposing these tubules to heat and cold can cause pain and increase the risk of tooth decay, which is why keeping enamel intact is so important. Diets high in acidic foods and drinks - Soft drinks and certain fruit juices, like citrus drinks, are very high in acid and acid is corrosive to tooth enamel. Diets high in sugar and starches - Diets rich in sugar and starches increase plaque. Plaque is made up of food particles, saliva, and bacteria. Bacteria eat the sugars left on our teeth. These bacteria release acid as a byproduct of digesting the sugar. Plaque sticks to our teeth and erodes our enamel by allowing continuous acid contact. Acid reflux and gastrointestinal problems - Gastrointestinal problems that allow stomach acid into the mouth increase tooth erosion. Like acid in soda and fruit juices, stomach acid is corrosive to our teeth. Dry mouth or low saliva production - Dry mouth, which is basically low saliva production, can increase tooth erosion. Saliva helps to naturally wash away food particles and neutralize acid in our mouths. The less saliva you produce, the more food and acid is allowed to remain on your teeth. Stress fractures - Our teeth can crack from the stresses of use in our daily lives. Any fractures or chips in the enamel will expose sensitive dentin to harmful acids, thus, increasing erosion. Teeth grinding - Teeth grinding wears away the biting surface of the teeth. Like with stress fractures, damaging the continuity of the enamel exposes dentin to acids and plaque and increases decay. Aggressive tooth brushing - Brushing your teeth over abrasively can do more harm than good. Long-term aggressive tooth brushing can wear down the enamel through friction. Frequent vomiting - Vomiting frequently, like with bulimia or binge drinking, is damaging to your teeth. Vomiting introduces stomach acid into the mouth, corroding away enamel. Decrease your consumption of acid rich food and drinks - When you do eat or drink things high in acidic content, be sure to rinse your mouth with plain water to help eliminate some of the acid. Chew sugar-free gum - Chewing sugar-free gum after eating helps remove food particles from your teeth, reducing plaque and acid. Drink plenty of water - Water helps to neutralize acids in our mouths and wash away food and bacteria. It keeps our mouths moisturized and reduces dry mouth. Drink with a straw - If you must drink sodas and fruit juice, use a straw. Straws help to reduce contact with our teeth by directing fluid to the back of our mouths. Use toothpaste and mouthwash with fluoride - Fluoride strengthens our teeth and can help reduce the effects of tooth erosion. Practice proper oral hygiene - Be sure to brush at least twice a day, floss once a day, and visit your dentist for regular checkups. Maintaining a clean, healthy mouth is the best way to avoid erosion. It is best to prevent tooth erosion before it happens, but if you already suffer from this condition there are treatments to repair the damage. Dr. Michael Bixby offers a wide range of treatments at our Red Bank restorative dentistry practice. Start the road to a healthy smile. Contact the Michael Bixby Center for Advanced Dentistry today for all your cosmetic and restorative dental needs.